Awards action: After eight months of awards activity revolving around film festivals, critics groups, industry associations and Hollywood guilds, the action has finally shifted to Academy members. Voting for Oscar winners began Feb. 12 and continues through Feb. 23. This is, of course, what the endless campaigning was all about and, long last, Oscar voters are casting their ballots. Unlike past years when late in the game there was a strongfavorite for best picture or, perhaps, a close race between two prime contenders, this year's race has been wide open with three films slugging it out -- but Sunday's British Academy (BAFTA) love for "The Revenant"appears to have tipped the scales in its favor. Nonetheless, all three front-runners have a lot to feel good about based on how they've been applauded to date. "The Big Short"won the Producers Guild of America's (PGA) outstanding producer award. The PGA and Oscar best picture winners have matched up for each of the last eight years. If we go back eight years before that, they matched up four more times.That's 12 out of 16 times – or 75 percent of the time. The Screen Actors Guild (SAG) gave its best ensemble cast award to "Spotlight. "Actors make up the Academy's largest voting branch with 1,138 of the Academy's 6,261 voting members. That's about 18 per cent of the Oscar voters and the likelihood is they'll vote the same way for Oscars that they did for SAG. During the 20 years that SAG's given an ensemble cast award, it's matched up 10 times with Oscar's best picture vote – or 50 percent of the time. That includes last year when "Birdman" took home both awards. The Directors Guild of America's (DGA) award went to Alejandro G. Inarritu for "The Revenant. "With 12 Oscar nominations, it has the most noms for any film this year. That strong show of support from a dozen Academy branches could add up to enough votes to win. In contrast, "Spotlight" has six Oscar noms and "Short" has five. Last year, after winning the DGA award for "Birdman,"Inarritu went on to win the best directing Oscar. This year marks the first time the DGA has ever voted back-to-back awards for a director. Since 1950, on only seven occasions has the DGA winner not also taken home the best directing Oscar. Frequently, but not always, the best picture winner is from the Oscar-winning director. That's what happened last year when "Birdman" and Inarritu both won. Although the three frontrunners all have best directing and film editing Oscar noms, only "Short" and "Spotlight" also have screenwriting noms – for best adapted and best original screenplay, respectively. Over the past 50 years, no best picture Oscar winner other than "Titanic" (in 1998) has won without also having had a screenwriting nom. So while it's possible to win without a screenwriting nod, the odds are heavily against it. The Writers Guild of America (WGA) announced its winners Saturday – "Spotlight" for original screenplay and "Short"for adapted screenplay. While it indicateshow the writers are likely to vote in the corresponding Oscar categories, it's not a great bellwether for the best picture race. A better set of tea leaves to read are the BAFTA's, which were heavily supportive of "Revenant." BAFTA's best picture award went to "Revenant," sharply lifting its Oscar prospects since about 500 of the British Academy's approximately 6,500 members also are members of our Academy and, presumably, vote the same way in both races. Unlike our academy, which went to 10 best picture nominees in 2009 and switched two years later to between five and 10 noms, the BAFTAs continue to be a five nominee race. Over those seven years, BAFTA'swinner has also won the best picture Oscarevery time -- except for last year when BAFTA celebrated "Boyhood" and our Academy applauded"Birdman." Those best picture matches between BAFTA and Oscar (with the years when the ceremonies took place) were: 2009 – "Slumdog Millionaire;" 2010 – "The Hurt Locker;" 2011 – "The King's Speech;" 2012 – "The Artist;"2013 – "Argo;" and 2014 – "12 Years a Slave." In the best directing category, BAFTA members applauded Alejandro G. Inarritu ("Revenant")just as the DGA did, making him Oscar's likely winner. On the screenwriting front, BAFTA echoed the WGA in celebrating "Spotlight" and "Short,"making them the front-runners in their Oscar races. "Revenant" was not Oscar or BAFTA nominated for its screenplay. 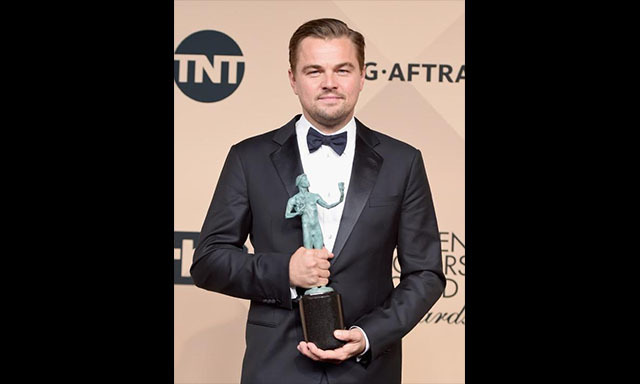 BAFTA's winning lead actors were Leonardo DiCaprio ("Revenant") and Brie Larson ("Room"), both of whom won in SAG's lead actor races and are now likely Oscar winners. BAFTA's supporting actor and actress wins for Mark Rylance ("Bridge of Spies") and Kate Winslet ("Steve Jobs") did not mirror SAG's votes in those categories for Idris Elba ("Beasts of No Nation") and Alicia Vikander ("The Danish Girl"). Rylance is Oscar nominated, but faces very strong competition from Sylvester Stallone ("Creed"), the sentimental favorite and likely winner. Elba did not receive an Oscar nod. BAFTA also voted its best cinematography award to Emmanuel Lubezki for "Revenant." Sunday also saw Lubezki win at the 30th annual American Society of Cinematographers (ASC) Awards. He won the Oscar in 2015 for "Birdman" and in 2014 for "Gravity," also winning the ASC awards in those years (plus earlier ASC wins in 2012 for "The Tree of Life" and in 2007 for "Children of Men." A fifth BAFTA went to "Revenant's" sound team, which is also Motion Picture Sound Editors (MPSE) nominee. The guild's 63rd annual Golden Reel Awards will be announced Feb. 27. Bottom line:The impressive best picture match-up between BAFTA and Oscar is another good reason to expect"Revenant" to survive in the final voting by Academy members. Nonetheless, when it comes to Oscar, surprises are always possible!